Fassinating Fassbender - A Michael Fassbender Fan Blog: Final night in Toronto: "Steve Changed My Life"
Final night in Toronto: "Steve Changed My Life"
This will be my last blog update from the fantastic city of Toronto, host of the wonderful Toronto Int'l Film Festival! Out of all the 8 years I have attended, this has been by far, the most fun and fulfilling! Here are some lovely images of Michael and Steve McQueen to wind down his appearance here, and in the local Toronto daily magazine '24 Hrs', I found a brief article about Michael and in that article was this cool quote. 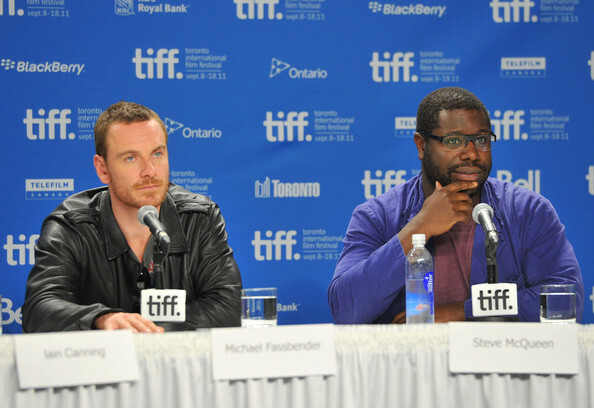 Michael Fassbender and Steve McQueen at TIFF '11 Press Conference, Sept 12th. Michael says about working with director McQueen - "Steve changed my life". When asked about upcoming projects, "I'm not doing anything. I'm taking the rest of the year off, because I don't want to bore everybody," he said. "Including myself. I want to clear the decks." Take that well deserved time off Michael. We'll be here waiting for the next venture. I'm looking forward to his personal downtime. I'll be very busy with classes, so a less busy Michael allows for me to have a more manageable schedule to dedicate the time to update FF as regularly as possible. 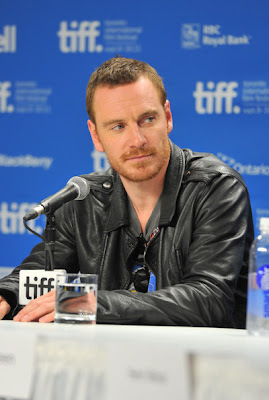 is fassbender quite hung???? ?im blushing here..when will u post the review simone? I have one more film to watch today and then I take the train back home. Most likely I will do an update on Thursday/Friday with exclusive photos, reviews of 'Method' and 'Shame'. Kelton, do watch Angel... 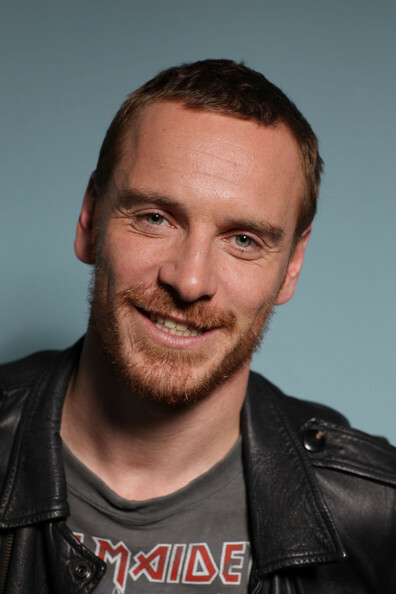 I think it's good for Fassy fans to make an effort to watch all his films to see his range as an actor. Jackie, there are a lot of articles written about Michael's nakedness in Shame. Some respectful, some extremely tacky - but they all convey the same factoid. the backstory he and McQueen created for Brandon. Since you are a TIFF veteran, do you know whether it's common for famous actors/directors to attend other people's films at this festival? Obviously buyers and other industry people do. I'm curious because I read that Ivan and Jason Reitman were there, as well as Gus Van Sant and James Franco. I think there were a few other people there I can't remember. Is that common? Kate, to answer your question, heck yes, a lot of actors attend screenings, directors, producers, assistants, etc. I have seen so many famous people once the lights come up. I've seen the Weinstein brothers quickly walk out of a screening once before, possibly to head off to another one. They are all there to work hard to promote their films, but they also love watching other films too. So yes, it is my understanding that 99% of the people in the audience at Shame, stayed for the Q&A, making it mind blowing to know that my question was heard by James Franco and other big names like him. My friend who sat a row behind Fassy said a lot of people raised their hands during the Q&A, I'm very lucky to have been selected by the moderator. thanks simone for your great work! i loved the interview (I even imagined the voices while i was reading) and i just wanted to say that you have a new follower of your blog in Chile!